Statins such as atorvastatin (Lipitor), rosuvastatin (Crestor) and simvastatin (Zocor) are among the widely used prescription drugs. 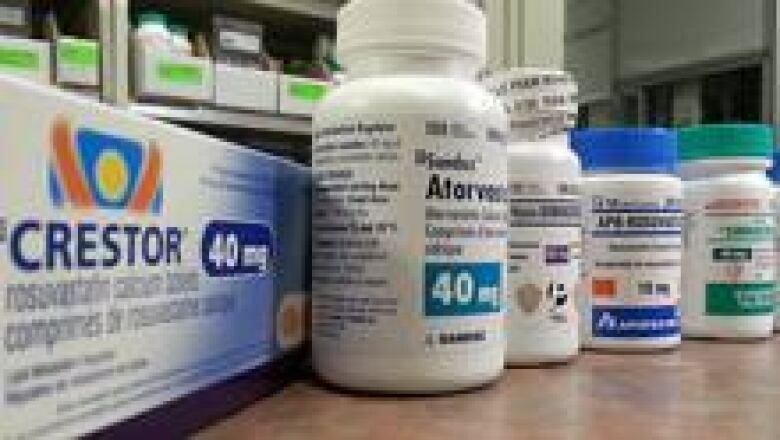 Since the drugs were first marketed 30 years ago in the U.S. for preventing a second heart attack or stroke in those who've already had one, there's been a shift toward prescribing statins for otherwise healthy people in Canada and the U.S.
"These are patients who really haven't had an event, a cardiovascular event, but they seem to be at high risk," said pharmacy Prof. Muhammad Mamdani, who works at St. Michael's Hospital in Toronto. "You also get populations where people seem to be relatively healthy, their cholesterol levels aren't that high, but for whatever reason, they are placed on a statin. That's a patient population that is a lot more debatable and some practices may not be warranted." The medical community is debating the pros and cons of using statins for prevention as more independent research comes out on side-effects. This week, a study in JAMA Internal Medicine suggested statins may be associated with an increase in musculoskeletal conditions and pain, especially in physically active individuals. "If you look at all the studies that have ever been done with statins for primary prevention, so for people who have never had a heart attack or a stroke, if you give a statin to a patient for about five years we can reduce the chance of a person having a heart attack or a stroke by about one per cent," said James McCormack, a professor of pharmaceutical sciences at the University of British Columbia. Other potential side-effects include risk of Type 2 diabetes, reversible muscle damage and short-term kidney damage. In Canada, as in the U.S., the majority of statin prescriptions go to primary prevention patients, not people with established heart disease, said Dr. Lee Green, a professor and chair of the department of family medicine at the University of Alberta who has surveyed doctors on their prescribing. "It seems we need to retrain physicians, and the public, to focus on actual risks, not on a convenient number like cholesterol level," Green said in an email. In March, epidemiologist Colin Dormuth, an assistant professor in the department of anesthesiology, pharmacology and therapeutics at the University of British Columbia, looked at the use of high potency statins and rates of admission for acute kidney injury. "There are a lot of patients out there taking the drugs right now who don't have a history of heart disease who are hoping to prevent heart disease and in all likelihood will derive absolutely no benefit," Dormuth said. In medical circles, discussions continue. A review published in January by British researchers who combed through trials sponsored by drug companies concluded that "statins are likely to be cost-effective in primary prevention." People like Jim Matheson, 62, of Toronto, are left to decide with their doctor. "Within five years he told me that I had a 20 per cent chance of either having a stroke or a heart attack," Matheson recalled. "He offered me the pill but I didn't want to take it." Instead, Matheson opted to eat healthier foods and exercise more. His brother on the other hand decided to go on statins. "I have sent him, probably for every article he has sent me on how good they are I have sent him 20 that says how bad they are. We're still having the dialogue," Matheson said. "We'll see who lasts longer," he quipped.